We are busy collecting donations from local businesses for this year’s raffle prizes. We have one night in a deluxe lakeview room with breakfast at Chateau Lake Louise, a helicopter sightseeing tour for two by Alpine Helicopters, a family VIP package for Sunshine Village, and many more! Full prize list will be posted here in early November, and tickets will be available for sale in mid-November and at the Artisans Market, Nov 19-20. This fundraiser does rely on parent participation, and we ask each preschool family to sell at least one book of tickets. There will be prizes for the families that sell the most tickets! 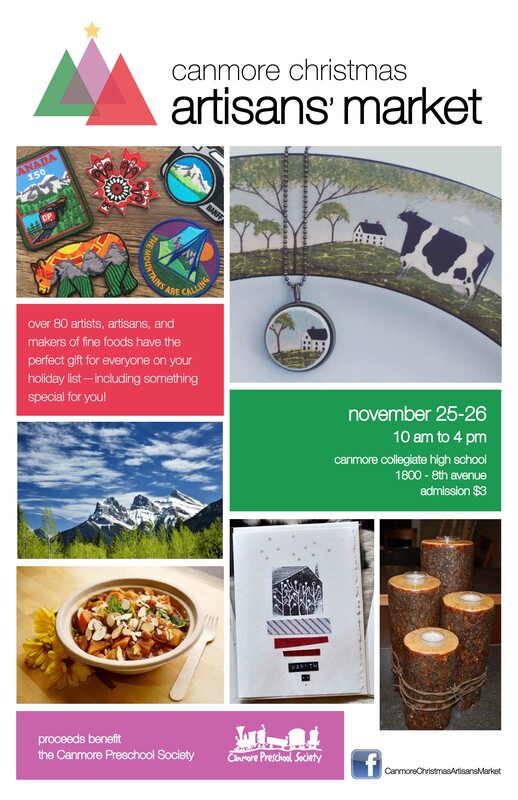 Mark your calendars – the 21st Annual Artisans Market will take place November 19 & 20, 2016 at Canmore Collegiate High School from 10am to 4pm each day. Admission is $3 in support of Canmore Preschool. Please visit the market website for more information for shoppers or artisans – canmoreartisansmarket.com. Please contact canmoreartisansmarket@yahoo.ca for inquiries about the market. Like us on Facebook to keep up-to-date on market news!